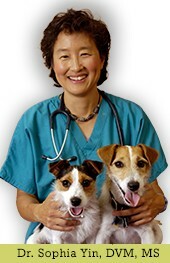 Dr. Sophia Yin gives some sage advice on breaking up a tussle between dogs. For more from Dr. Yin, find her on Facebook or at drsophiayin.com! If you have a dog and he goes to the dog park, lives with doggie housemates, or otherwise socializes with other dogs, chances are that at some point you may need to break up a spat. These may range from low-level altercations with no real contact to a no-bites-spared brawl. So what should you do? First, realize that regardless of the amount of noise, most fights between unfamiliar dogs at the dog park or first fights between housemates are spit and drool matches. 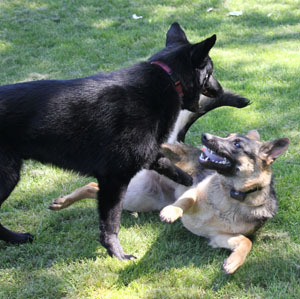 When bites are involved during these fights, dogs generally bite and release. So in the majority of cases we do not need to worry about prying the jaws open or getting dogs to actually release. Instead, our major concern is just getting the dogs apart and to do so without getting bitten. The number one way to avoid being bitten is to avoid trying to grab the head or neck area. Frequently while trying to grab the front end or getting in the between the dogs, the humans accidentally get bitten. Or in the heat of the moment a dog actually turns and redirects aggression to the person pulling them away. The safest method to get the dogs apart is to grab them by the rear end and quickly pull them away. In other cases, because of your positioning in relation to the dog or because they are moving around too quickly, you may need to shove one away by placing your foot on their rib cage and pushing. This is safer than bending over and trying to push with your hands. It may also allow you to use your hands to grasp the other dog if you don’t have someone else to help. These two situations highlight that creativity may win over force. Also consider using a spray deterrent such as citronella (Direct Stop or Spray Shield) or pepper spray. They can work in some cases too. Just remember—in all cases avoid actions that will cause the dog to redirect it’s aggression to you or even unintentionally lead to a bite. Once you have the dogs apart you should pay attention—does your dog want to keep fighting or does he immediately calm down or try to get away? The one who wants to continue fighting will require more work to modify the behavior in the future. In either case, you’ll want to understand why a fight occurred instead of just assuming it was a fluke or hoping the same type of situation won’t occur again. A majority of the dog aggression behavior cases involving bites that I treat have a history of getting into low level spats which over time developed into more dangerous fights. Many fights can be prevented simply by noticing when one dog is tense around another and calling the two dogs apart before there’s trouble and then rewarding your dog for good behavior. To learn how to recognize signs that your dog is anxious and may be ready to get to a fight reach Chapter 1 in this free online book: Low Stress Handling and Behavior Modification of Dogs and Cats. To learn how to teach a really good "come when called," read this blog and watch this video.